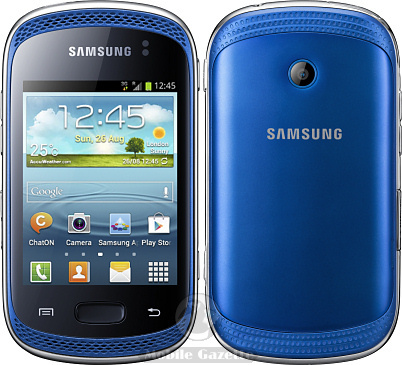 The Samsung Galaxy Music is a low-end Android smartphone that comes with some useful audio playback enhancements. When we say "low-end", we really mean it.. the screen is an ultra-basic 3.0" 240 x 320 pixel panel, on the back is a cheap 3 megapixel flashless fixed-focus camera which does at least manage decent WVGA 25fps video recording. Inside is a so-so 512MB of RAM with a processor of unknown speed. Because this is an Android smartphone then it's already a pretty good music player and you can download a huge number of multimedia related apps to go with it. Music playback is enhanced with a frontal stereo loudspeaker with SRS Surround Audio, a dedicated music key, integrated FM radio and a number of other enhancements. As with all other Android devices, the Samsung Galaxy Music has 3.5G, WiFi and Bluetooth connectivity. It comes with a microSD slot to expand the internal 4GB of flash memory, and it supports both GPS and GLONASS positioning systems. This is an Android 4.0 smartphone, and there aren't many of those at the lower end of the market, although no upgrade path to Android 4.1 has been mentioned. There's no word on pricing either, but we would expect this to retail for less than €130 when it hit the shops.. and we are guessing that this will be by the end of the year.